Croatia is a popular choice for activity holidays with its rugged coastline and some of the clearest water in the Mediterranean. Against this backdrop, enjoy our unique combination of walking, cycling, kayaking and snorkelling or simply take time out on one of its many beautiful beaches. Our guided bike tour starts at the Kažun Park near the city of Vodnjan, we journey through tranquil olive groves and cultivated fields and finally to the city of Fažana, where we can enjoy a magnificent view of the Brijuni Islands National Park. Here, we can enjoy the beautiful beaches and have some free time for swimming. The cycling tour is approximately 17km in length and includes a helmet and bottle of water. Cape Kamenjak is a nature park located on the Premantura peninsula on the southern tip of Istria. We can discover this beautiful landscape and the islands that surround it by kayak, with endless beaches, caves and coves to explore. After our excursion, there is free time where we can take a dip in the beautiful Adriatic Sea. Discover a fascinating world of marine plants and animals in our guided snorkelling trip, dive into an underwater cave and take underwater photography in the big blue! We will be snorkelling in the southernmost point of the Istrian Peninsula, where you can see the best marine life in the Adriatic. Istria is famus for its rich and diverse natural beauty which makes it a hiker’s paradise. During this 7km walking tour we can enjoy beautiful blue skies and marvel at the beautiful bell towers of the Istrian medieval towns. I enjoyed all the activities and the balance of being organised and having time to myself. It's great to have a Tour Leader, as it makes one feel really relaxed and cared for, which I think is important on singles holidays. I found the whole process a breeze. Our Tour Leader was friendly, personable and professional and he made sure no one in the group was left out. We had lots of fun, laughter and adventures during our activities and I have very fond memories of the holiday. This was my second Solos holiday and it didn't disappoint, I'll definitely be booking another Solos holiday in the near future! A brilliant holiday in very good company. Activities were varied and well organised and the organisers were friendly and helpful. Special thanks to the Tour Leader for pulling it all together and researching the best ways to spend our free time. Located just a 4 minute walk from the pebbly beach in Medulin the Hotel Holiday provides us with a simple yet comfortable base for our activity holiday. Hotel facilities include: 2 outdoor salt water pools, sports centre, a sun terrace with sun loungers and parasols, a café bar set in hotel garden and a la carte and buffet restaurant. There are tennis, mini-golf, handball, windsurfing and volleyball courts located nearby (extra charges apply). Room facilities include air conditioning, satellite TV, safe and hair dryer. There is free Wi-Fi available throughout the hotel. The transfer time from Pula Airport to the Hotel Holiday is approximately 15 minutes, depending on weather and traffic. Istria is famous for its rich and diverse natural beauty which makes it a hiker’s paradise. During this 14km walking tour we can enjoy beautiful blue skies and marvel at the beautiful bell towers of the Istrian medieval towns. 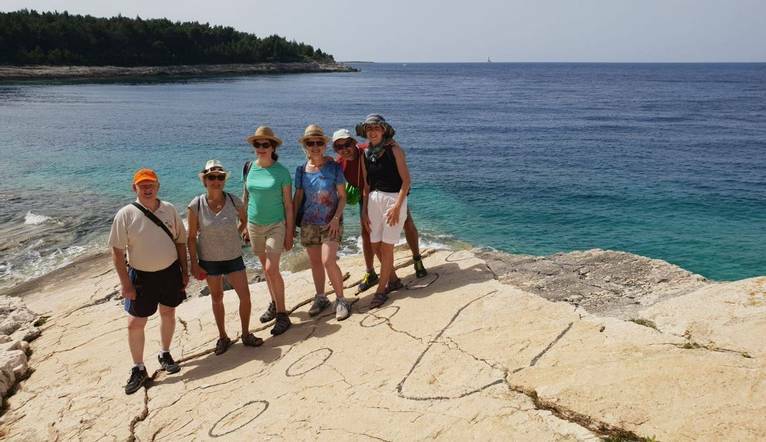 Guided tour of Pula – €26pp - Pula is the largest city in Istria, situated in the southern tip of the Istrian peninsula. It has a long history of winemaking, fishing, ship building and tourism. It has also been Istria’s administrative centre since ancient Roman times. Panoramic boat tour to the National Park of Brijuni - €45pp - This sightseeing tour includes a ride by tourist train, a visit to the remains of a Roman villa, a visit to the Church of St Germain which has a permanent exhibition of frescoes and ancient writing from Istria.